Are you looking for an easy and comforting meal to make for dinner? A meal that is warm, creamy and delicious! Packed full of hearty filling of vegetables and chicken and topped with the sweet cornbread topping. 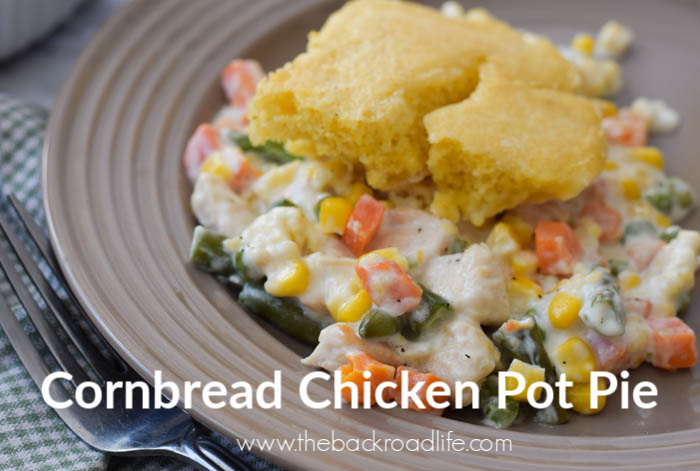 This Cornbread Chicken Pot Pie is made from scratch and large enough to feed a bigger family with some left overs. Perfect for those cooler months when you're craving comfort food! Pot pies are a classic great comfort food to enjoy during the fall and winter months! The savory goodness of gravy, a mixture of vegetables, and chicken all baked together under fulfilling crust. We are in the heart of winter here in Indiana with this unusual Polar Vortex going through. This week we have had cold cold temperatures reaching in the -40/-50s with the wind chill. School has been canceled, my husband's work has been closed. We haven't left the farm. What a great time to spend cooking and we have done a lot of it. 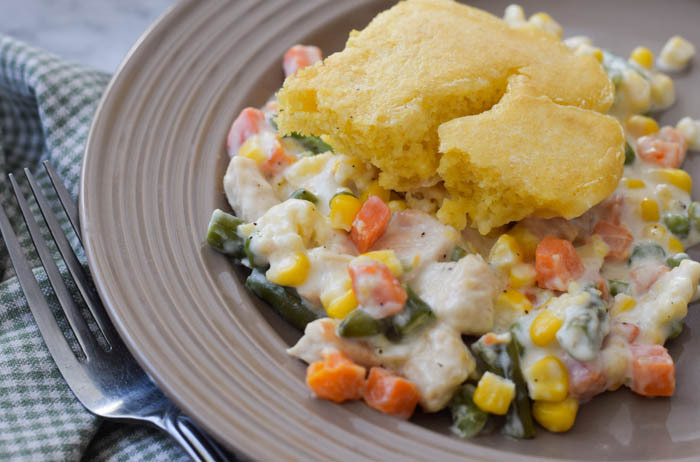 This homemade Cornbread Chicken Pot pie doesn't disappoint. Quick. Simple. Tasty. A delicious all in one meal. 1. Place the frozen vegetables in a large sauce pan and cover with water. Over medium high heat, bring to a boil. Cook vegetables until they are tender, about 5-10 minutes. Drain and set the vegetables aside. 2. In a small saucepan, melt the butter. Add the chopped onions and saute for 2-3 minutes until just barely tender. Add chicken broth, salt, pepper, and flour. Stir until well combined. Then add the cream and stir continually while cooking until the mixture thickens, about 4-5 minutes. 3. Pour sauce mixture over vegetables, add the cooked chicken and stir everything together until coated well with the sauce mixture. Spoon the vegetable mixture into a greased 9 x 13 baking dish and set aside. 1. In a large mixing bowl, add the cornmeal, flour, sugar, Clabber Girl Baking Powder, and salt and stir to combine together. Add the milk, melted butter, and eggs. Stir together until mixture is well blended and smooth. 2. Spoon the cornbread mixture on top of the vegetable mixture in the baking dish. Spread out the cornbread mixture to cover the filling. Bake at 400 degrees for 20 -24 minutes, or until the cornbread is golden on top. 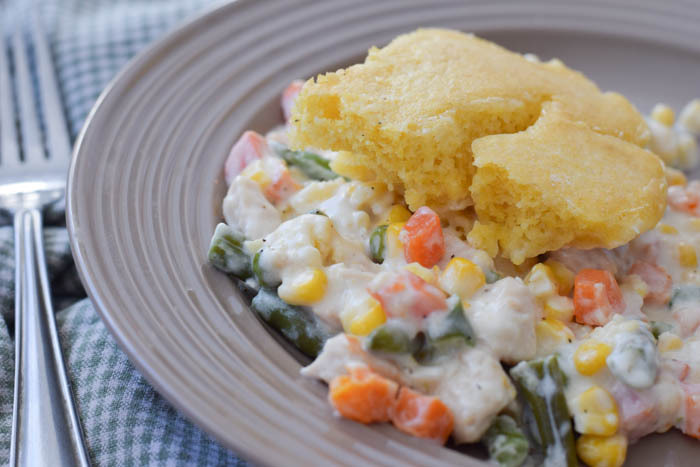 Enjoy this Cornbread Chicken Pot Pie next time you're looking for a hearty meal!